SuMono Design - Hip garments made from Japanese textiles. The individual attention given to each garment and the quality of the fabric itself makes SuMoNo the ultimate luxury brand for fashionable modern women who are passionate about prints and are lovers of fine textiles. Classic shape western garments made with these gorgeous fabrics allow the wearer to be their most unique and fashionable self. "My passion for textiles had its seeds in childhood sewing, and came to fruition with the frustration of the uniformity of commercial design. Once I visited Japan, the beauty, variety and quality of Japanese kimono fabrics captivated and motivated me. Over the course of 10 years, I have studied and carefully evaluated over a million kimono." Kimono Fabric is only 14" wide! Japanese looms were only 14 inches wide and patterns weren't designed with symmetrical repeats, so placement of the patterns to cut the garment is a recurring design decision. 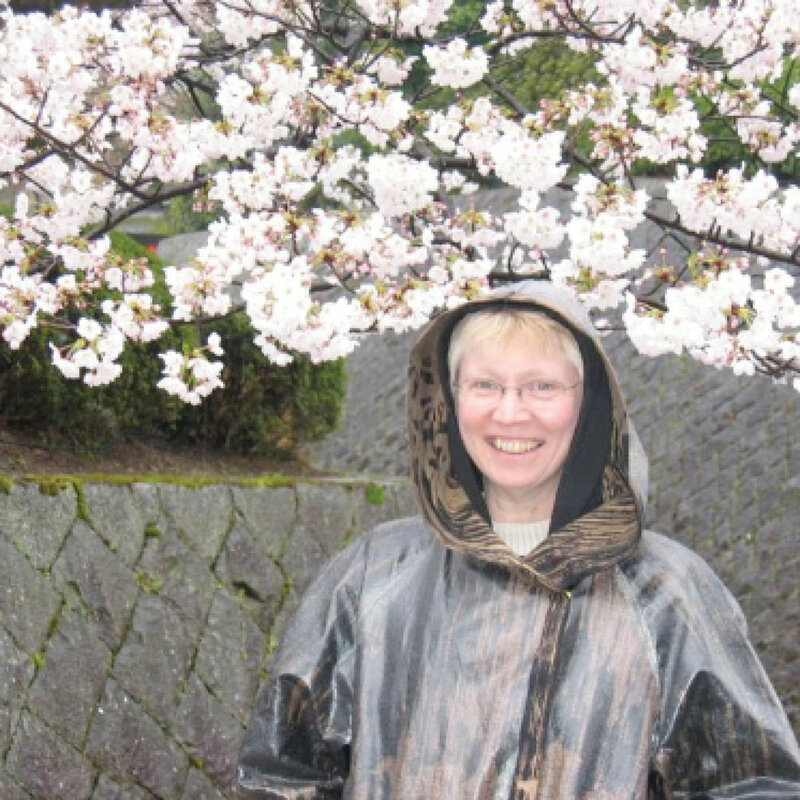 The artist in Japan - wearing the raincoat that inspired the collection. "The timelessness of these fabrics, the beauty, grace, playfulness and luxury of them has been a source of endless wonder for me and I realized that I wanted to wear these wonderful fabrics…"
"The beauty, variety and quality of Japanese kimono fabrics captivated and motivated me. Over the course of 10 years, I have studied and carefully evaluated over a million kimono."